There's something charming about the unflagging optimism and excitement of filmmaker James Nguyen. His third self-financed film, "Birdemic: Shock and Terror," was intended to be a terrifying thriller in the vein of his idol, Alfred Hitchcock. Instead, its unintentionally hilarious trailer has been making the rounds on the Internet and garnering attention from the likes of Entertainment Weekly, which called the film "the best worst movie of all time," and the hosts of "Tim and Eric Awesome Show, Great Job!," who hosted the film's L.A. premiere. It's even earned comparisons to another film that built a cult following off being bad, Tommy Wiseu's "The Room." The 42-year-old Nguyen took four years to make his epic, which centers on a couple (Alan Bagh and Whitney Moore) attacked by birds of prey. He financed the film, which cost less than $10,000, through his day job as a software salesman in Silicon Valley. It's endearing to hear Nguyen talk about the film—which he always refers to by its full title—with reverence and passion. Even though it has ended up playing better as a comedy, Nguyen is more than happy to be in on the joke. As he puts it, "When people go see 'Birdemic: Shock and Terror,' I hope people have a few good laughs and are entertained, but that they walk away thinking." Back Stage: Where did you get the idea for "Birdemic"? James Nguyen: I'm a huge Hitchcock fan, and one of my favorites is "The Birds." Even though it's not my favorite of his—that would be "Vertigo"—"The Birds" is a very prophetic film. It dealt with issues that were ahead of its time. I work in the Silicon Valley, and it's pretty stressful, so to relax I go down to the bay and look out to the sea. It's very refreshing. So I thought, "Why don't I make a movie that's part homage to 'The Birds' but it's modern and contemporary and features a bird of prey?" Back Stage: Where did you learn about filmmaking? Did you attend film school? Nguyen: It's just something I picked up. I went to the film school of Hitchcock cinema. I watch a lot of Hitchcock movies, and I'm self-taught. I picked up a camera and started filming 11 years ago. I was always interested in the movies as a fan, especially romance films. The first I can really remember liking was "Somewhere in Time," with Christopher Reeve and Jane Seymour, and "Romeo and Juliet." But romance alone isn't enough for me; there has to be some mystery, some suspense, like a thriller. I found that in Hitchcock cinema. Even though Mr. Alfred Hitchcock never referred to his greatest thrillers as romantic, they are in my opinion. 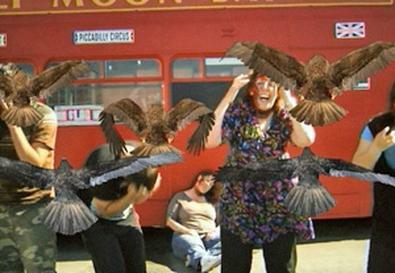 Back Stage: "Birdemic" is actually your third film. You previously released "Julie and Jack" and made a film called "Replica"? Nguyen: "Replica" was never released, and I wasn't very happy with it. I kind of look at it as a very expensive storyboarding experience. One day I hope to remake it. I learned a lot on that film in terms of casting. Part of the reason people like "Birdemic: Shock and Terror" a lot is due to the casting. I really messed up on the casting on "Replica," so that's why I took so much time to do it properly for "Birdemic: Shock and Terror." Back Stage: How did you go about casting "Birdemic"? Nguyen: I couldn't afford a casting director, so I did it myself, through SFCasting and LACasting. I actually had two false starts. I started production in 2006, but the lead actress wouldn't stay in a Motel 6 and I didn't have a budget for a Hilton or a Sheraton, so I had to spend the whole year recasting. But I lucked out with Whitney Moore. She's a natural born actress. She's like Robin Williams: She's a natural comedienne. She's gifted, talented, and beautiful. Alan Bagh is the kind of guy who would do well with Method acting—you can see him get thinner throughout the film. He has the kind of personality that he's going to make it in Hollywood. Back Stage: Are you still working your day job? Nguyen: Yes, until I get a three-picture deal with a Hollywood studio where the director fee is at least $5 million, I probably have to keep my day job. The movie business is fun and glamorous, but it's not stable. You don't know where your next job is coming from. Making movies doesn't pay my bills. Back Stage: How do you feel at the screenings when people laugh at the movie and start interacting with it? Nguyen: Our first L.A. screening went really well. It was sold out and the audience received it well; it was hilarious. A lot of people walked up after the screening to say they liked it, and I really appreciate that. Then I went to the Alamo Drafthouse screening in Austin, and that was sold out too. They were laughing and appreciating it and accepting it for what it is. I truly believe this movie has the starts of a cult following. Back Stage: But did you intend it to be funny? Nguyen: No. I put a couple humorous scenes in, but I never intended it to be all funny. It's supposed to be a serious movie, a romantic thriller, and shock you. But it became something else. One blogger called it the next "Rocky Horror Picture Show." People are laughing and participating. Back Stage: So you're just glad it's being seen? Nguyen: Yes, I'm very appreciative because it's been a long way to just get distribution. I got rejected by all the film festivals, and I told myself, "I spent three or four years of my life making this movie; I should at least try to get distribution." So I went to Sundance, and what I did was plaster my van with a poster and fake blood and I drove down Main Street. It created a lot of attention. A police officer pulled me over, and I said, "I'm just trying to promote my movie." He checked out my van and my I.D., and when he saw I did nothing wrong, he said, "Hey, good luck with your movie!" Back Stage: And unlike many filmmakers, you actually ended up selling your film at Sundance, correct? Nguyen: I met Severin Films at Sundance and we struck a deal, and the rest is history. And here I am talking to you. Back Stage: Do you have your next project lined up yet? Nguyen: Yes, Severin has a million-dollar development deal for my next film. It's another romantic thriller, called "Peephole: The Perverted." We'll probably start production later this year. It's a romance between a serial killer and an aspiring actress. There's twists and turns and it's not going to be just another slasher film. What makes this movie different is it asks you to empathize with the serial killer because of what happened to him as a kid. Back Stage: Have you seen "The Room," and how do you feel about the comparisons to that film? Nguyen: I'd never heard of it before, but people have compared it and I had a chance to see it. When I watch it, I understand why there's some comparison in terms of the camera movement. He has scenes where he pans left or right, and my style is the same. I like to pan the camera and have movement—it's called a movie. So there's some similarity there, but it's by coincidence. That's basically it. I think that "Birdemic" is a much more sophisticated, much more compelling story. What I and Mr. Wiseu have in common is we're both indie filmmakers and we dared to make a movie with what we have. I respect him because he dared to make his vision, win or lose. "Birdemic: Shock and Terror" is showing March 26–27 at the IFC Center in New York. For more information, visit www.birdemic.com.